As the attendees made their way for one last final after show drink on Tuesday night, it was hard to shake the feeling that this year, NRF was all about the customer. Keynote after keynote saw retailers of all sizes, emphasizing a consistent message: in times of rapid change the key to future success is bound to your ability to know and understand the needs of your customer base. While customer-centricity may have sounded the biggest note of the event, over the course of a jam-packed three days we heard about subjects as varied as the ‘millennial challenge’, the need for innovation in the physical environment, and a strong call for diversity among the business community, making the show – as ever – a fascinating one to attend. People don't buy what you do, they buy why you do it. And what you do simply proves what you believe. The ever-popular Simon Sinek offered an interesting take on what it means to be a customer-centric business in 2019. By positioning brand integrity as the ultimate motivation for consumer buy-in, Sinek provides a neat sound-bite to capture the mind-set of the increasingly conscientious consumer. After all what we choose not to buy, says just as much about us as what we do. A new feature at NRF this year that really hit home was The Female Quotient sponsored Girls’ Lounge. Host to a series of fascinating conversations celebrating the need for diversity in modern business culture, Mindy Grossman put forward as strong a case as any arguing why, if your business sidelines diversity as mere tick-box measure, you’re ‘essentially de-prioritizing long-term success’. “Start with the consumer in every decision. Invest in yourselves. Reinvest in stores, tech, fulfillment and your teams. Disrupt yourselves.” – Brian Cornell, Target. While we touched on Cornell’s superlative keynote in our mid-way round up, we’d be remiss not to come back to his 4-point recipe for success, one of the most shared highlights of NRF. Cornell demonstrates how every step of Target’s successful turn around was grounded in these four fundamentals, reflecting a key understanding: every improvement you invest in has to be for the good of the customer experience. • We don’t just need to do less harm, we need to seek to do MORE GOOD. • < 3% of funding goes to environmental NGO’s so Patagonia has invested > $100 million. In another inspiring example of a retailer ready to stand up for the conviction of their beliefs, Patagonia’s Rose Marcario demonstrated how actively aligning your brand values with those of your consumers can be more than a mere ‘strategy’ for customer success in 2019. With 3% of all funding dedicated to environmental NGO’s, Patagonia has built its reputation as a challenger brand whose consumers aren’t simply fans of the product, but loyal advocates philosophically aligned to Patagonia’s core beliefs. Proving once again that real CX extends far beyond the mere transactional level. If you were at NRF yourself, we hope you enjoyed a fantastic few days in the Big Apple. 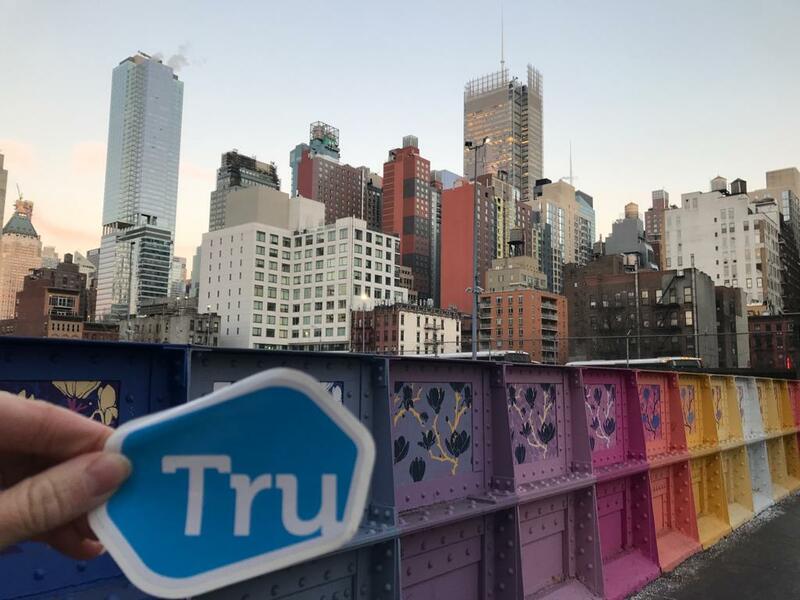 It was a tremendous show for Team Tru, and we’d like to thank each and every one of our incredible partners for making it such a huge success. Till next year, goodbye NRF!